You’ve likely heard in the media in recent years the terms Universal Design and Aging in Place for homes. 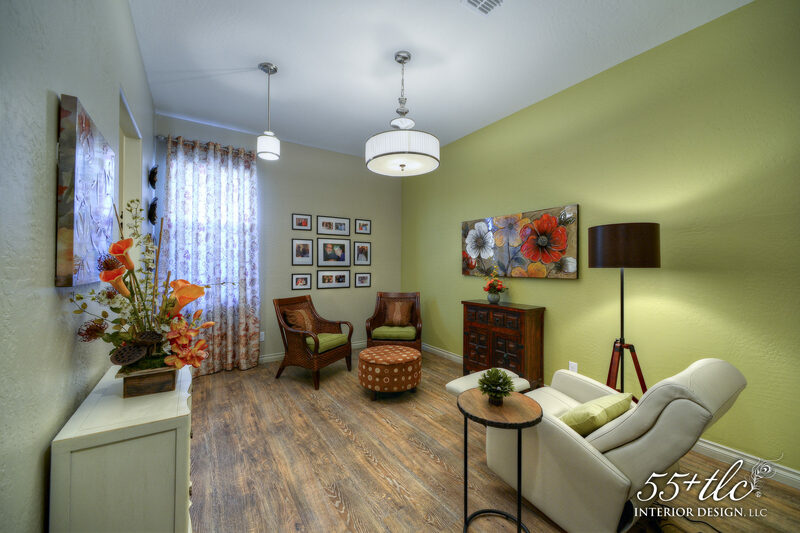 Although its name is more intuitive, Senior Living Design hasn’t been publicized because it’s practiced commercially in independent and assisted living and memory care communities, and on more rare occasion in assisted living care homes. Why should you know or care about these terms? Because design matters for successful aging and knowing the difference between Universal Design, Aging in Place Design and Senior Living Design will empower you to make the best housing decisions for you and your 55+ loved ones. Each of these three types of design share one feature – wheelchair accessibility. Beyond that they are different. Seems logical, right? If they were all the same, would they have different names? Of course not. As a seasoned designer trained in and practicing all three types, I promise you they are each different. However, I’m continually finding architects and interior designers don’t even know the difference. To make it worse, now companies are deliberately interchanging the terms in order to sell more products, services, and training to the trades. They believe that by calling everything Universal Design consumers will find it more palatable than Aging in Place. Most do not know any better and simply follow the big companies’ lead. The problem isn’t with the products, it’s that they are teaching consumers that Universal Design is what older adults need, which is wrong and misleading. Read the following definitions, examples and my best tips pertaining to each to understand why. Universal Design makes buildings or homes accessible to all, regardless of age, size, or ability. It has been implemented in commercial design for more than two decades. You transparently engage with Universal Design whenever you’re in a public building. It includes wheelchair-accessibility, which eliminates access barriers. However, Universal Design also requires compromises in design to accommodate the majority of people. For example, the design needs of children are very different than those of older adults. Implementing design for one population would render the space restrictive to the other, so a design compromise is intentionally made. The important takeaway here is that the specific design needs for older adults are not addressed with Universal Design because it needs to work for the majority, hence the name “universal.” Universal Design is best for public or commercial spaces and for homes where there are two or more generations (multi-generational) living under one roof. Aging in Place Design makes homes safe for adults 55+ to live safely, independently and comfortably throughout the aging process. It shares the basic principles of Universal Design, but goes further, taking into account design for the unique and specific needs of older adults. Because 99% of homes are not Aging in Place ready, according to a 2017 Harvard Housing study, homes usually require some remodeling. If your goal is to stay in your home and age successfully and be independent, it’s wise to invest in yourself and hire an Aging in Place remodel designer to proactively prepare your home – before you need it. Just like child-proofing a home – Would you wait until your toddler has an accident or take precaution in advance? Being pro-active to protect your independence at 55+ should be a priority. You’re worth it! Senior Living Design is highly-specialized, science/evidenced-based design that supports physical safety and psychological and emotional wellness for older adults. Senior Living Design and Memory Care Design are the highest, most comprehensive levels of design for adults 55+ and require the most training. It’s a specialty with a limited number of practitioners and an even smaller number qualified in Memory Care Design. Senior Living Design and Memory Care Design includes the basic principles of Universal Design and Aging in Place Design but go well beyond. Most independent, assisted and memory care senior living communities’ common areas have been designed and furnished by professional senior living interior designers to meet the unique needs of older adults. However, when residents move in safety wains. Because residents or their families usually decide to “decorate” the apartment. Again, design matters. A senior living interior designer should be hired to create a safe, accessible furniture arrangement, select or purchase senior-friendly furniture, and design for other needs to prevent falls, make daily activities easier and for comfortable living. The rest of the community has been designed and furnished for safety and wellbeing, your apartment should be, too. You’re worth it! I have found it rare for assisted living care/group homes (categorized as up to 10 beds) to be designed by a professional senior living designer, which is very unfortunate as it puts residents’ safety and wellbeing at risk. Some assisted living home owners are proud of how their homes look. However, senior living design is art and science. Pretty is nice, but without the science behind professional senior living design, there isn’t safety. It’s important to always inquire and vet a senior living community or assisted living care home on their care, staff, food, activities, amenities, neighborhood, etc. But be sure to also find out who designed it. Google and research the design firm or individual. Are they a qualified professional senior living interior designer? It’s a matter of life safety, health and well-being, so it needs to be part of the housing decision for you and your loved ones. You deserve it! I am an advocate for adults 55+. My expertise and passion are helping to make the rest of life the best of life for my clients through design in private homes, senior living communities, assisted living care homes, and residents’ apartments in senior living communities. I am trained, experienced and award-winning in the specialties of Senior Living Design, Aging in Place Remodel Design, Universal Design, and Memory Care Design. I’d like to be your designer! The National Association of Home Builders (NAHB) Remodelers announced the winners of its annual Homes for Life awards, recognizing excellence in aging-in-place and universal design remodeling projects. The awards were presented at the NAHB Remodelers All-Stars Celebration in Las Vegas on Feb. 19. The Homes for Life awards were expanded into multiple categories in 2018, resulting in four winners across five categories. Dave Myllymaki of Vancouver, Wash., won the Multi-Generational Remodel category; Bonnie Lewis, CAPS, Allied ASID, Associate IIDA of Scottsdale, Ariz. won both the Bath Remodel and Whole-House/Multi-Room Remodel categories; Jeni Finnigan, CAPS, of Unbounded Space and Amie Faust of Half Dozen Designs in Denver won the Kitchen Remodel category; and Iris Chadab, CAPS, NKBA, of Windows to the Walls Interiors, LLC of Alexandria, Va., won for the Best Overall Certified Aging-in-Place (CAPS) design. Certified Aging-in-Place Specialists are remodelers, general contractors, designers, architects, health care professionals and others who have been taught the strategies and techniques for designing and building aesthetically pleasing, barrier-free living environments to help home owners live in their homes safely, independently and comfortably, regardless of age or ability level. ABOUT NAHB REMODELERS: NAHB Remodelers is America’s home for professional remodelers, representing nearly 50,000 members of the National Association of Home Builders (NAHB) who are involved in the remodeling industry. Founded in 1982, the organization provides information, education and designation programs to improve the business and construction expertise of its members and to enhance the professional image of the industry. Its membership incorporates nearly 100 local councils in nearly every state. Learn more about remodeling at nahb.org/remodel. ABOUT NAHB: The National Association of Home Builders is a Washington-based trade association representing more than 140,000 members involved in home building, remodeling, multifamily construction, property management, subcontracting, design, housing finance, building product manufacturing and other aspects of residential and light commercial construction. NAHB is affiliated with 800 state and local home builders associations around the country. NAHB’s builder members will construct about 80 percent of the new housing units projected for this year. Has your house outgrown you? Perhaps you’ve become empty nesters and no longer need all that space. Perhaps your lifestyle priorities have changed, and you want to shed or lighten the burden of home maintenance. Perhaps you want to cash out and reduce your expenses. Or, perhaps it’s only you now and you want a fresh start. No matter the reason, adults 55+ need to be very strategic in selecting the home they’re downsizing to. 1. Think beyond dreamy, active adult retirement years and remote locations. Find a community and house where you can live out your golden years. As we age, physical and cognitive decline naturally occurs, and there may be unanticipated medical problems. These things need to be factored into where you live and the house you live in. 2. Before you buy the downsize house, hire a Certified Aging in Place Specialist (CAPS) to do an Aging in Place Home Evaluation. Why? A house is a big investment. For a nominal cost, you’ll learn whether the house has what it needs, or is a good remodel candidate, to meet your needs beyond the active adult years. 99% of U.S. homes are not ready, according to a 2017 Harvard Housing Study. Even most new construction homes are not. It’s best to find out sooner rather than later whether or not the house you’re considering is. An Aging in Place Home Evaluation is similar to a home inspection, but there’s a completely different, extensive list of items being evaluated. Schedule an evaluation prior to making an offer on the house or during the inspection period. You’ll be advised on areas that need improvements and/or remodeling and the investment it will require. Then you’ll be able to make an educated decision as to whether that house is the best for you, long-term. 3. 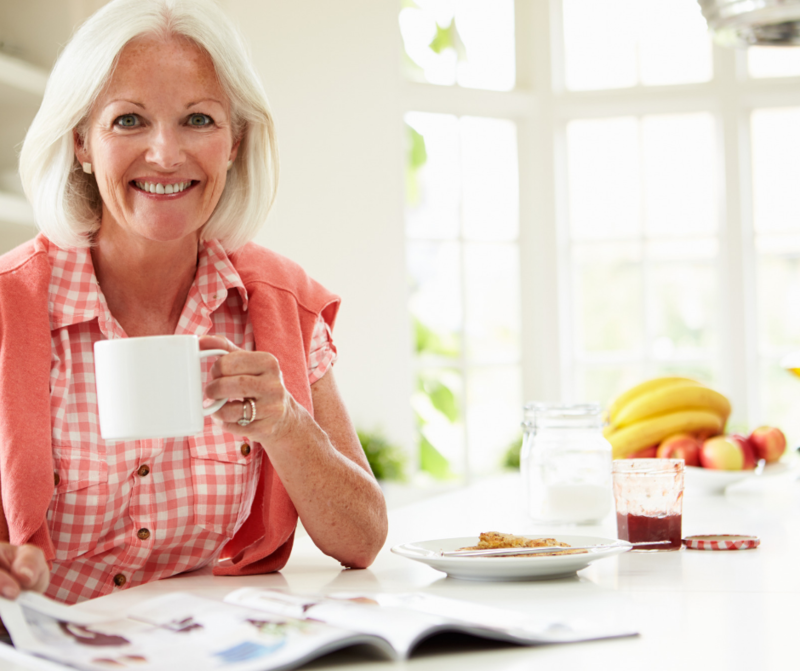 Have a proactive mindset about preparing your house for successful aging rather than “I’ll do it when I need it.” Because your needs will change as you age – it’s a scientific fact of life. Waiting to prepare your home “until you need it” is too late! Your home needs to be Aging in Place ready for fall and accident prevention to avoid injury or death, and to access and use key areas (entry; bedroom; bathroom: toilet, shower, sink; and kitchen) via a wheelchair, – before you need it. Otherwise, you very well may be forced (abruptly) to move again, to assisted living at a cost of $45,000 or more per year). None of us want to think we will need any of that, but the reality is if you’re proactive now with Aging in Place design and remodeling, you’re far more likely to live longer, be independent, and be able to stay in your home if that’s your preference and avoid the cost of assisted living. And, the good news is 1) your bathroom or home doesn’t have to look like the ugly, institutional image that just popped into your head, 2) when done beautifully, it will increase the home’s market value. But it takes hiring the right design professional. One that is expert in the science of design for older adults, and whose work is also aesthetically attractive. 4. Have your downsize house prepared (designed and built or remodeled) for Aging in Place by a senior living interior designer and licensed contractor. The best and most convenient time to do it is before you move in. It’s a wise investment in your longevity and wellness. Many people mistakenly think that adding grab bars is it, or worse, they think it’s a DYI project. Grab bars should not be installed like you’d hang a picture. Walls need to be prepared. It’s a matter of life safety. Don’t cut corners that could cut short the life of you or your loved ones, just to save a few dollars. The bottom line is the house you’re downsizing to should be professionally designed, built or remodeled and furnished to meet your needs for today, tomorrow and beyond. Only highly-specialized professionals are qualified to do that. 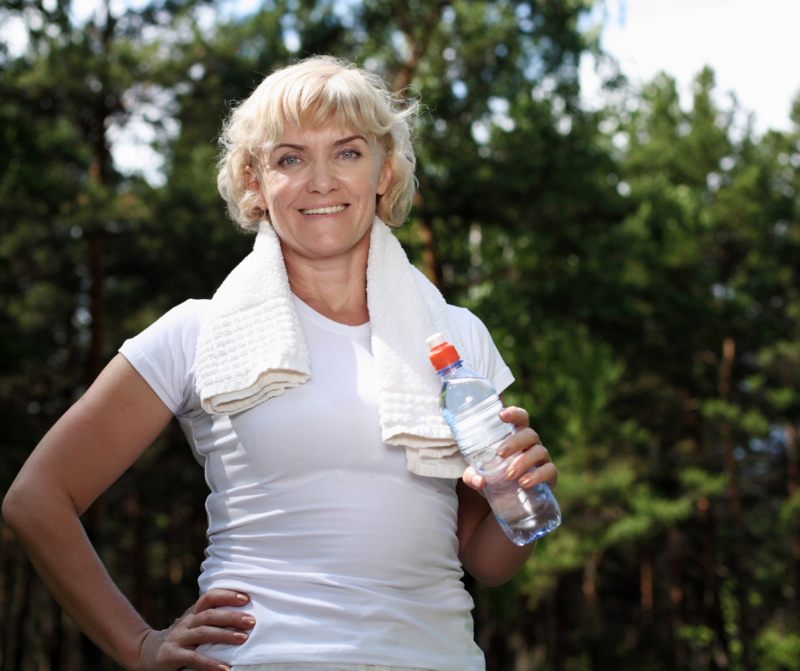 You can either be proactive and tackle aging head-on or be in denial. Your choice will either positively or negatively impact your longevity, independence and quality of life. If you’re considering downsizing, call me. Also, if you’re in the Phoenix area, I have some fantastic Realtors that specialize in the real estate needs of older adults that I can introduce you to. A new paper published in The Lancet Neurology, led by the University of Melbourne and the University of Washington, funded by the Bill and Melinda Gates Foundation, reports that the number of people living with Alzheimer’s and other dementias globally more than doubled between 1990 – 2016, from 20.2 million to 43.8 million. By, 2050 the researchers are projecting that more than 100 million could be living with dementia related diseases. The 2016 study found dementia was more common at older ages, with the prevalence doubling every five years over age 50. It also found that 22.3 percent of healthy years lost to dementia in 2016 were due to four modifiable risk factors: being overweight, high blood sugar, consuming a lot of sugar sweetened beverages and smoking. There is a significant potential for prevention of dementia. As reported in Neurology, (Dec. 19, 2018) an ENLIGHTEN trial revealed that regular exercise boosts executive function (impulse control, emotional control, flexible thinking, working memory, self-monitoring, planning and prioritizing, task initiation, and organization) and can potentially delay the onset of dementia in adults at risk for it. Research from Queen’s University and the Federal University of Rio de Janeiro recently published in Nature Medicine show that irisin, a hormone that is boosted by exercise, plays an important role in the brain and that Alzheimer patients carry less of the hormone. Boosting levels of irisin in the brain could slow the progression of the disease. Dementia develops over at least 20 to 30 years before it is diagnosed – these findings allow us to act now to eliminate the risk factors and potentially ward it off, for ourselves and our loved ones. There are Memory Care communities (standalone or within senior living/assisted living communities) with excellent programs to keep residents active, engaged, comfortable and safe. They are not inexpensive at $5,000 to $12,000 per month (depending on the community and state it’s located in). Some of these communities also offer short respite stays. When staying at home or moving in with family, it is important to take away car keys and provide other methods of transportation for the person with dementia. It may be emotionally difficult, but it’s for safety and protection. Here in Arizona there are way too many ADOT “Silver Alerts” providing a license plate number and vehicle description with a plea to help find an elderly person with dementia that never returned home! Many times, it does not end well. Hire caregivers with dementia training, available through home care agencies, to provide assistance and/or respite for family members. Have the home designed for dementia-support by a qualified dementia design professional. Dementia-supportive design will optimize independence and quality of life, preserve dignity, and reduce dementia-related fear for your loved one. Because dementia-supportive design is so highly-specialized, there are relatively few designers nationally that have the essential specialized training and experience. Of the ones that do, nearly all work exclusively on the commercial side designing for Memory Care/Senior Living Communities. I am dementia-supportive design trained and experienced. And, because God gifted me with the ability to design for both residential and commercial (which is uncommon, for a variety of reasons), 55+ TLC Interior Design is pleased to offer dementia-supportive design and Aging in Place design services for residential private homes and design for commercial Memory Care and Senior Living Communities. 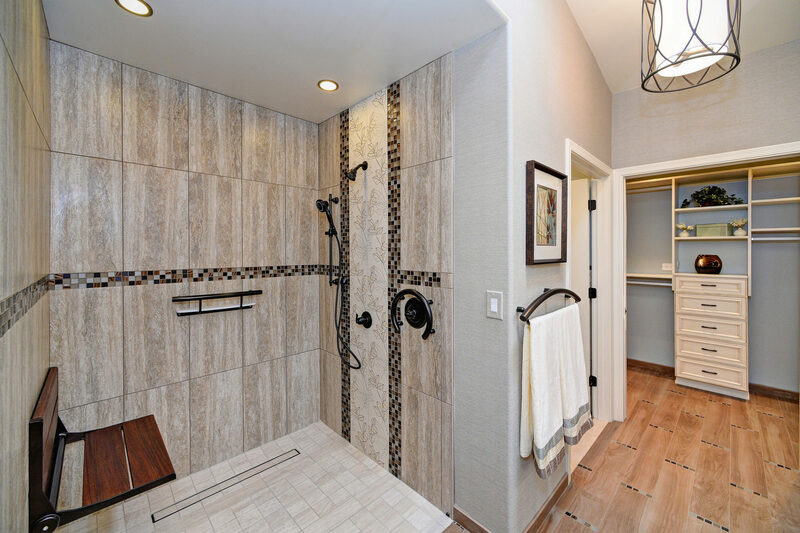 Twenty-five years after a homeowner and her late husband built their Fountain Hills, Arizona home, renovating the master bathroom had become a bucket list item for 89-year-old Melba. She wanted a beautiful, updated bathroom. A contractor had been out to give her an estimate. 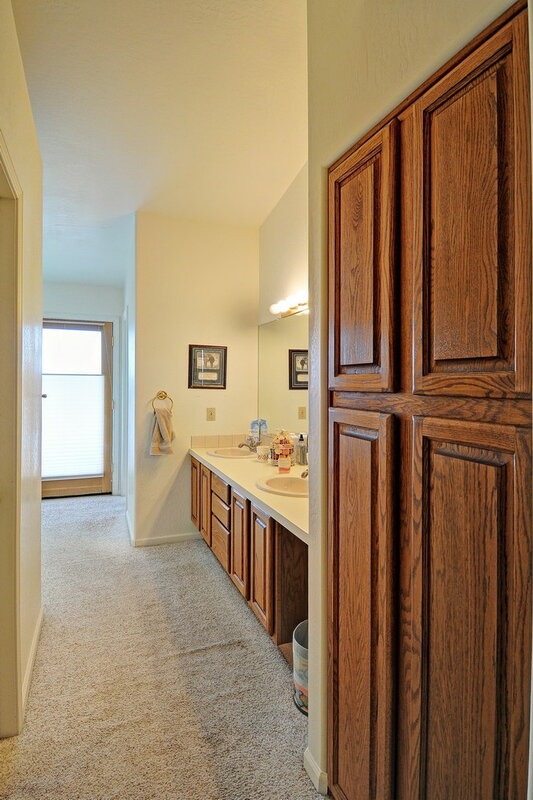 He recommended the typical basic – granite countertops and new flooring. Melba then thought she should contact an interior designer and called me. That was a wise decision since contractors are trained to build, not design. Yet, homeowners often expect contractors to do the work of a designer – everything from space planning to selecting lighting, plumbing, materials and paint colors. Then they’re unhappy and wonder why things didn’t turn out as functional or aesthetically correct as they expected. The consequences can be worse and even life-threatening if Aging in Place design and construction is not done by specialized, qualified professionals. Before making recommendations or starting conceptual design, I dove deep to learn Melba’s wishes for her bathroom, her specific needs, and how long she planned to live there. I also interjected the concept and importance of incorporating Aging in Place Design for anyone 55+. Being mentally sharp and physically active, she had not considered that safety and accessibility features should be central to the design. After I suggested it, it didn’t take long for Melba to recall how difficult it was for her husband to maneuver their bathroom while using a walker the last few years of his life. She agreed that it would be valuable to have an Aging in Place-ready bathroom, if I could also make it beautiful. 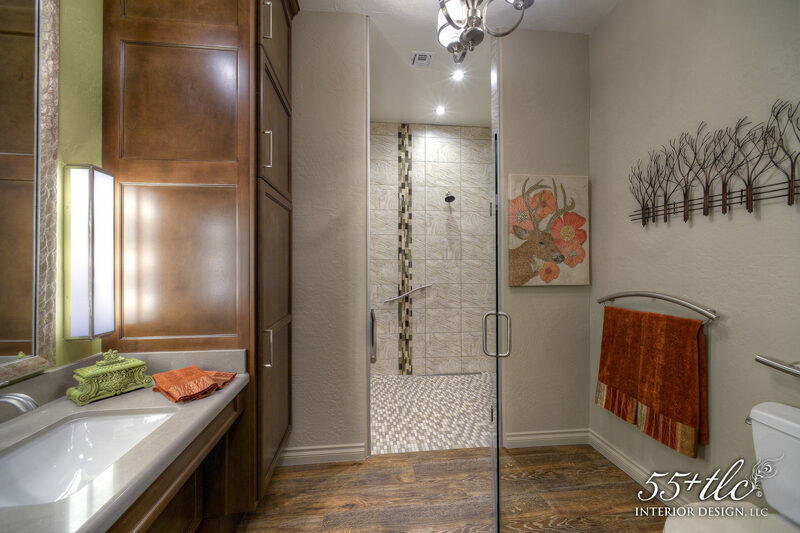 Despite that Melba’s master bathroom was a decent-sized 185 square feet, it didn’t feel large. It felt tight when entering and in front of the double vanity. The water closet was small and confined and the walk-in closet was small. The shower’s excessive length was essentially wasted space. 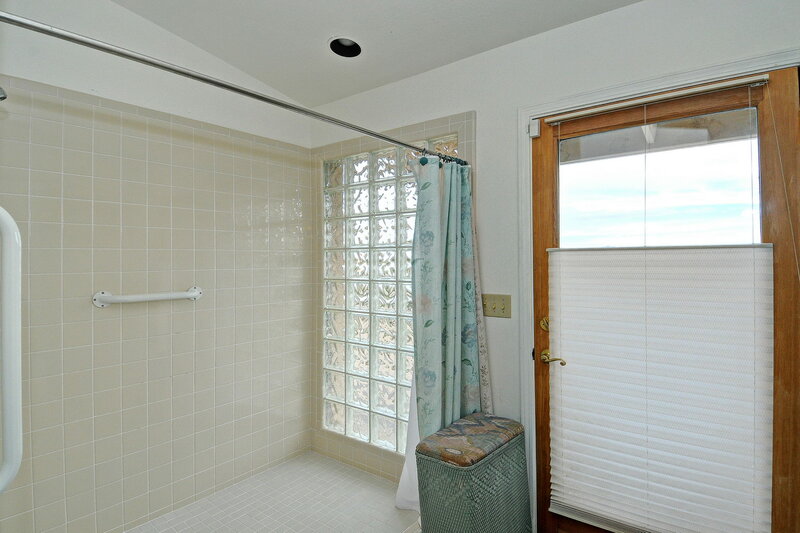 As built, the master bathroom was inaccessible by a wheelchair and nearly that with a walker. Within the existing footprint of her home, without adding on, I designed a new floor plan that is more functional, eliminated the access and space constraints, and is ADA-code compliant (wheelchair accessible). The plan included moving the shower and water closet, as well as the wardrobe closet to give Melba the larger closet she desired. Other key considerations for the design included safety (fall prevention and night toileting), ease of daily activities, ease of maintenance, an uplifting aesthetic, and Melba’s mild vision impairment. To address these, the design incorporates: spatial solutions; visual orientation; support solutions; senior-friendly lighting, flooring, colors and finishes; ADA-compliant products; and special detailing. For example, I custom-designed a wheelchair-accessible vanity, linen closet and wardrobe closet, each with senior-friendly features for ease of use with daily activities. 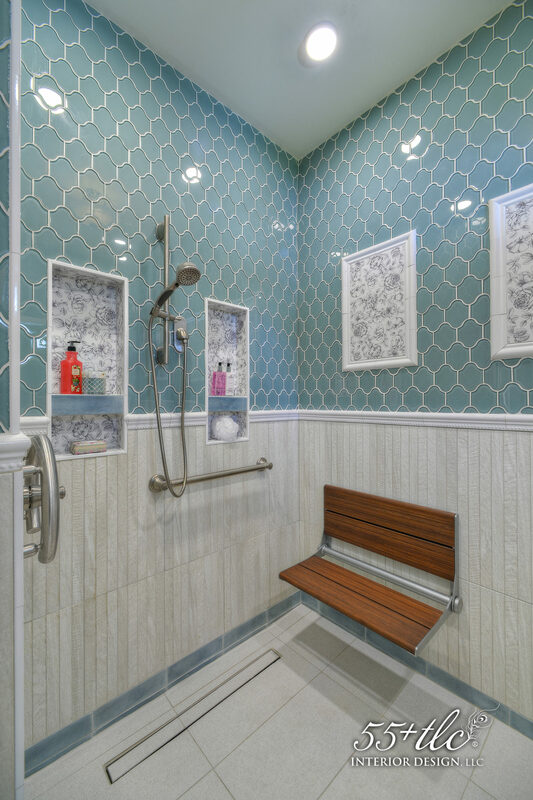 The shower is also designed for wheelchair-accessibility, safety and ease of use with features that support independent or assisted showering, should a caregiver or wheelchair be needed in the future. Additional sources of light needed were calculated and precisely located throughout the bathroom to help Melba with her vision. I meticulously weigh the impact and outcome of every decision in the planning, construction and design process. Because I understand how important it is. 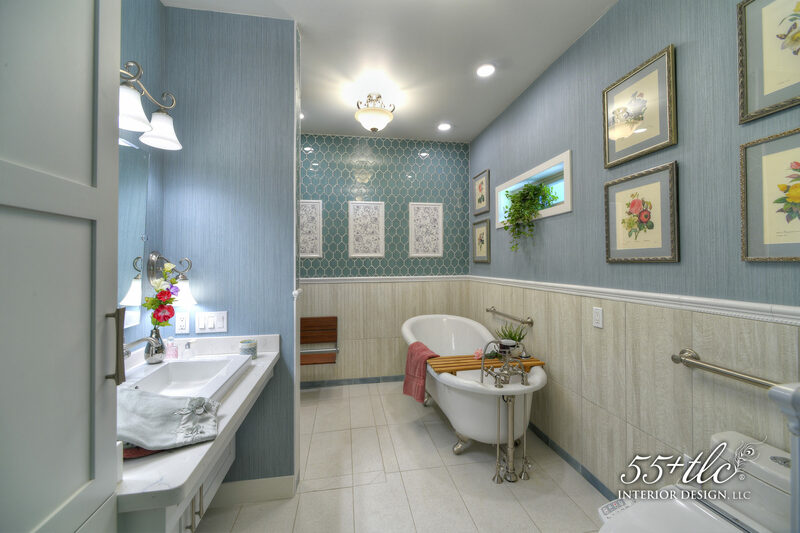 Melba is poised to live independently, better and longer following her wise decision to have her master bath professionally designed and remodeled for Aging in Place, beautifully. It will serve her well by significantly reducing the risk of harm or death in the most dangerous room of the house. It will make her daily activities easier, accommodate her needs as they change over time, and make in-home caregiving easier, if ever needed. Melba now has options and better control as to where she will live in the future. If she needs to use a wheelchair, she has the option to continue living in her home. She also has the option to move to assisted living on her terms if, and when she chooses. Most people either don’t have or don’t realize they could have had those options, until it’s too late. Once the option to live at home is no longer feasible, there is usually an urgent, abrupt move to assisted living or skilled nursing, which can wreak financial and/or emotional havoc on the homeowner and their family, when unplanned. According to a 2017 Harvard Housing study, 99% of U.S. homes are not ready for aging in place. Contrary to popular belief, simply adding grab bars does not make a home aging in place-ready, as the study points out. It’s remodeling work that needs to be well-designed and executed by a degreed, professional Senior Living or Aging in Place Interior Designer or Architect and a Certified Aging in Place Contractor who is trained in precise building and installation of features and products for ADA-code compliance, before there’s an immediate need or crisis. Having no plan is planning to fail. “As a physician, I’m probably more keyed into abruptness seeing episodes occur every day with patients and life can change in a moment,” says William J. Strohman, M.D. of Lifescape in Scottsdale, Arizona. Hospital discharge planners frequently need to release patients to rehab, assisted living or skilled nursing because their home environment is not safe for them. Otherwise, home care service or a care manager must be hired to help prevent falls and accidents. 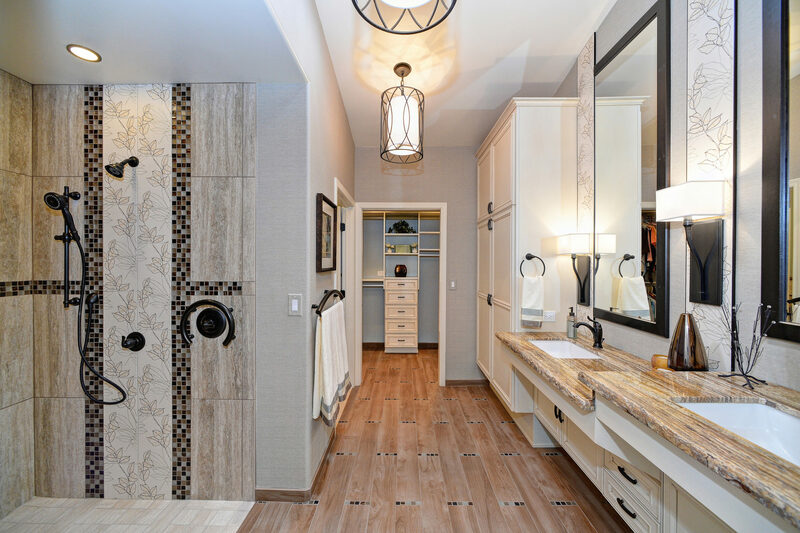 Because Melba’s Aging in Place bathroom design and remodel is aesthetically pleasing rather than sporting the typical ugly, institutional-look, it has increased the home’s market value. That will equate to more money to pay for assisted living if Melba decides to move, or more money for her estate if she lives out her life there. Not to mention increased marketability as there aren’t many single-level properties with beautiful Aging in Place-ready master bathrooms, during a period when more Boomers are aging, and the need is increasing. Melba now has a National Award-Winning Master Bathroom, from the National Kitchen & Bath Association (NKBA), that she loves and enjoys every day. It gives her peace of mind knowing that it is safer and is helping her to maintain her independence. She also appreciates that it has expanded her options for the future. Is your remodeling contractor really qualified to design for aging in place and senior living? We all knew it was coming and you’ve seen the headlines. Boomers are getting older and life expectancies are growing longer. It comes as no surprise to anyone that we have an aging population challenge on our hands, which will continue to grow over the coming decades. Whether planning your own retirement years, seeking the best possible living environment for your parents, or facing big decisions that impact the residents in a senior living community or care home you manage, I think it’s safe to say we all want to ensure seniors stay as safe, happy, healthy, and independent as possible in their later years. However, I’ve noticed a disturbing problem that concerns me as someone who specializes in aging in place remodel design and senior living interior design. As economists, business analysts, and popular media outlets squawk about the coming “silver tsunami,” many companies are looking to cash in on what they see as a gold rush opportunity. There’s certainly nothing wrong with paying attention to economic trends and serving the needs of a particular market segment. The more we can do to make the “second chapter in life” more secure and enjoyable for seniors, the better.